OK, so I’m not ready for the white stuff quite yet…how about some virtual snow flakes instead? Join me in supporting the 77kids Wish-4-Snow Charity Program. You have the chance to win prizes (including a $50 gift card here) and all it costs is a few minutes of your time. 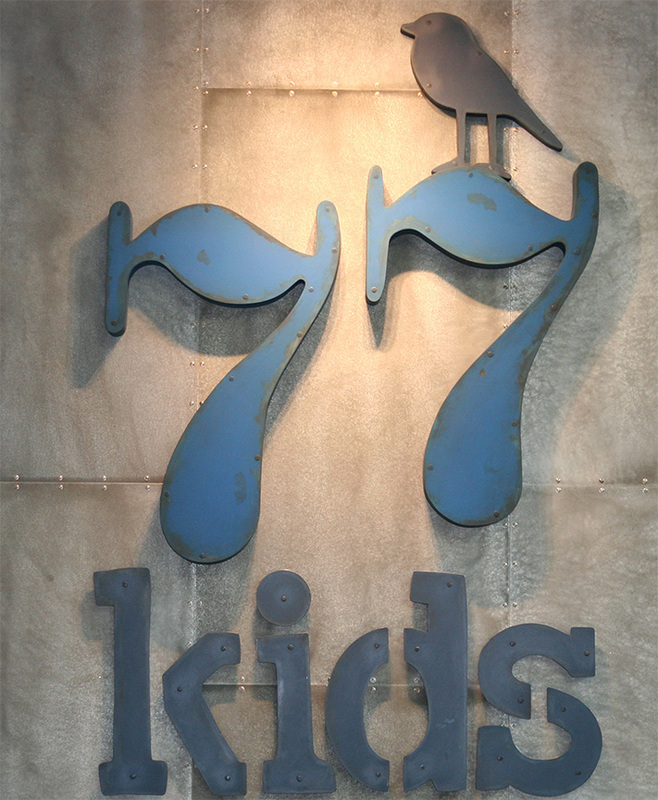 77kids is the new children’s clothing line by American Eagle. I shopped at the Robinson Mall store when they opened this summer and loved the clothes. 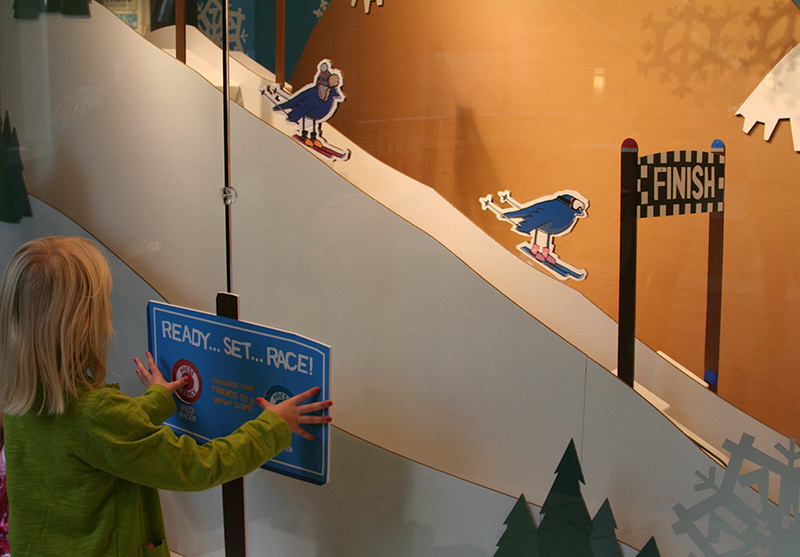 I had the chance to visit the store Monday morning with Juliana – watch her explore the store, hang out with some friends, and learn about the Wish-4-Snow Program. 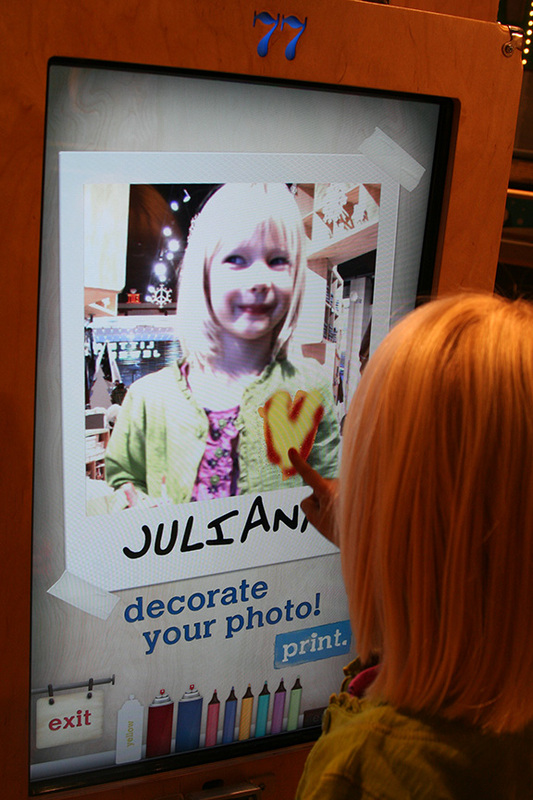 The store is filled with activities to keep kids busy so moms can shop. 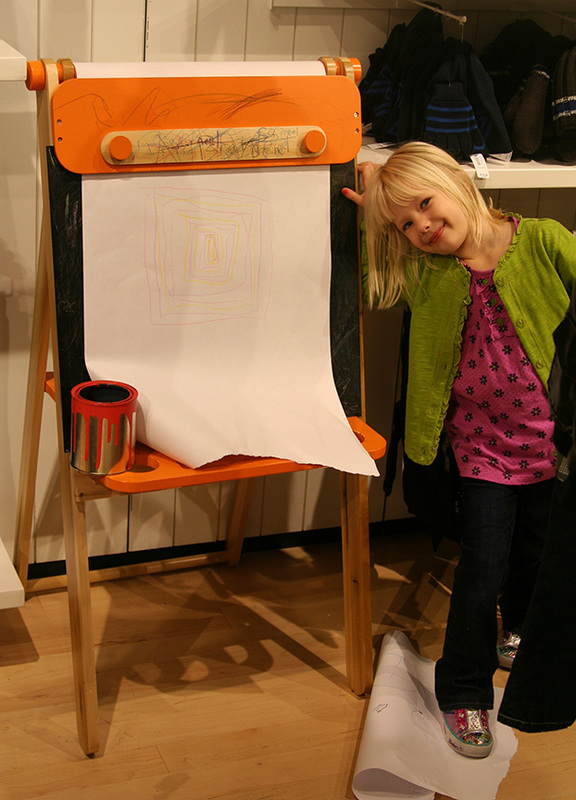 An easel with crayons, lights projected on the floor that move when someone steps on them, a chalk board, a candy bar, and a display where they can take a picture of themselves (their favorite subject), embellish and print. Juliana printed 4 pictures while we were there. The store window has a new interactive display with racing birds. Juliana was shy to try it out at first, but soon she sat and raced the birds with a friend and then by herself – push buttons, watch for the winner, repeat. And then I shopped. During my summer shopping trip I purchased a bunch of stuff for the boys – I was impressed by the cool options and the sturdy construction. I wish the store was around when they were born; the baby clothes are so different than the options in most stores – colors like gray and black that are unheard of in a pastel baby world. With her long legs and skinny waist, it is not easy to find clothes for Juliana, especially pants. So I took advantage of having her with me, dragged her away from the picture booth for a few minutes and she tried on some clothes. We ended up leaving with some corduroys (they met her requirement for soft pants), a t-shirt with lots of sequins (something sparkly) and a dress with a twirly skirt (the dress pictured below with the gray, pink and black striped skirt). 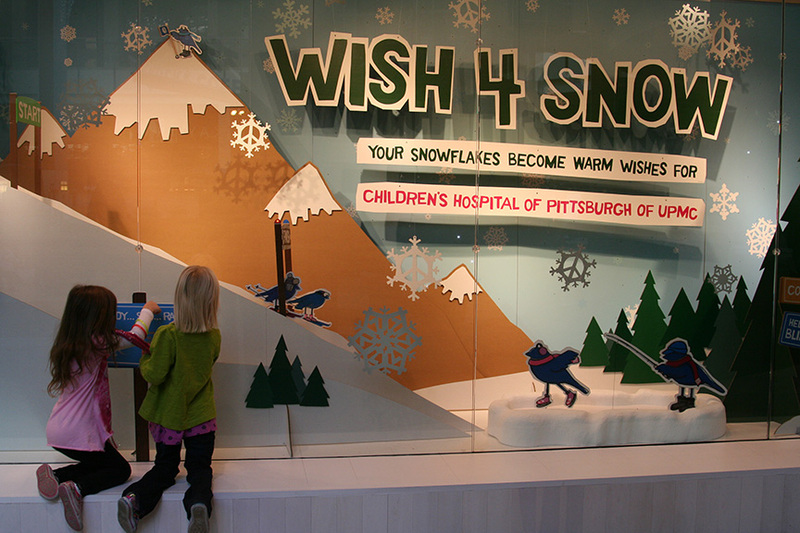 You can support your local children’s hospital when you visit the store by purchasing a snowflake for 77 cents (or more). Proceeds from the store I visited will go to Children’s Hospital of Pittsburgh. Juliana wrote her name and a wish on her snowflake and was was so excited to hang it on the blizzard wall. She insisted that I pick her up so it could be the highest one. 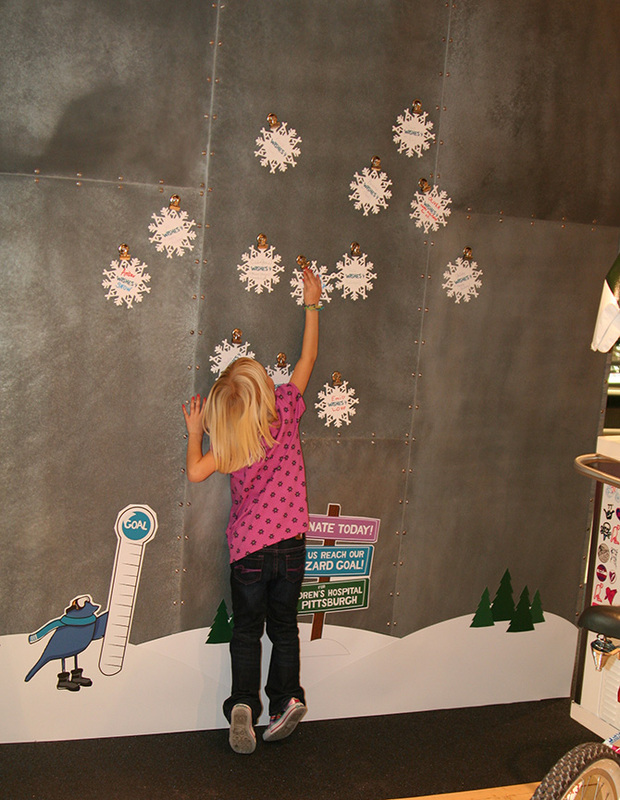 Visit the Wish-4-Snow website and design your own snowflake. If 100,000 snowflakes are created, 77kids will donate an additional $25,000 to the children’s hospitals that are part of this program. There is no limit to the number of snowflakes you can create and a gift card will be given away daily on the site and there is also a grand prize. Win a $50 77kids gift card here! 1 – After you create your snowflake, come back here and leave a comment. You can leave a comment for each snowflake you can create. On December 6th, I will randomly select a winner from all eligible entries for the $50 gift card and notify the winner via e-mail. If the winner does not respond within 24 hours, I will select another winner. DISCLOSURE: I am promoting the Wish-4-Snow charity initiative in collaboration with 77kids and The Motherhood, and have been compensated for my involvement. The opinions expressed in this post are completely my own. Cute stuff, but hard to make the snowflake. I created a snowflake! I could make them all day! I follow 77kids on twitter. I like 77kids on facebook. I like 77 kids on Facebook. i made a snowflake for my daughter. i made a snowflake for my son too! I follow 77 kids on twitter. The random number was 12 – Congratulations to Kathy!